James has returned to Waiouru and is making his mark in the bedroom by completing 80% of the small bedside cabinet to the right of the head of the bed. Richard, James and I had a lengthy discussion about the height of the cabinet. It could be below the level of the top of the mattress. But then Jan or I might accidentally brush anything on top to the floor whilst asleep. It could be at the same height as the mattress. This seemed to be the worst option as we envisaged banging an elbow or your head on it whilst asleep. In the end we decided it should be higher than the mattress. The disadvantage is it will mean making the bed will be slightly more difficult. 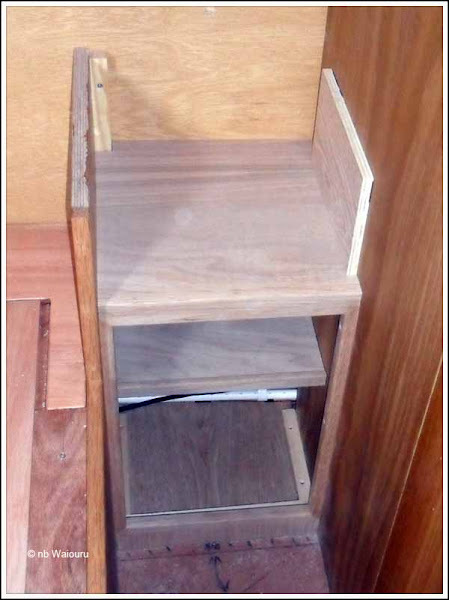 The cabinet has three sections; a small storage cupboard with a shelf in the bottom; an open shelf in the middle and a flat top. The horizontal sections have been quite difficult to cut and the rear wall runs in two dimensions which is of course caused by the curve of the hull. James is undecided whether to fit two opposing vertical lengths of oak trim on the face of the open (middle) section. 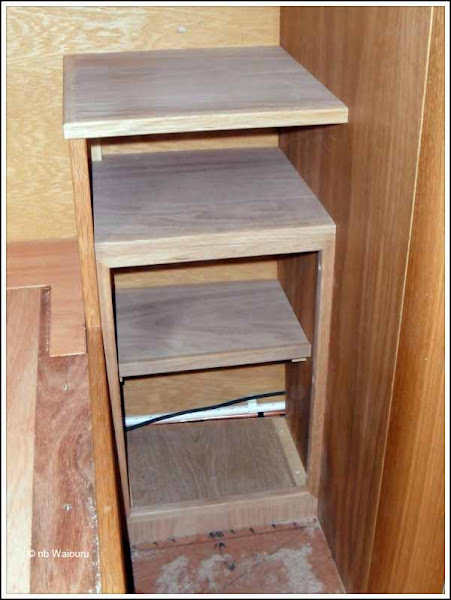 Doing this would match it with the cupboard below but they are not required for any structural reason. The jury is still out! A false panel will be fitted across the back to conceal the pipes and wiring. He will probably start on the other side of the bed next week.